What are the most celebrated features in the international art scene at the moment? The big art fairs, such as The Armory Show display candy art, and communicate the global tends. What strikes through from the art fair’s mass volume is the moment factor. The art takes place in the now, and is grasped as intensely global. Sometimes the moment appears as too loud and cacophonic, and as hard to perceive. However, it is always interesting to see how new ideas are shaping the content of the art world. Currently, we certainly live in an era of an object, we believe in the objects, and are looking for new center pieces that reflect more dynamic, perhaps organic, maybe even transformative ideas. With the object comes the abject, the ideas, the observations in the chaotic, the necessary artistic vision and paradox. The abject visualizes our need to give shape to turmoil in the world and in our personal lives. In the midst of it, there is a sense of calm, a need to seek out to other realms, or to give the paradoxes a more usual everyday reference. Art has hardly ever been so metaphorical as it is now. Here pulsates both the object and (its) abject. Berta Fischer’s sculptures attracted with their transparency and with their neon-candy volume of lightness, they are popular and easy to access. Some of her works have a different texture in them, like the oval-shape, red-yellow wall sculpture below. It comes closer to definition of an abject reminiscing of the interior, and the morphological. Nicole Eisenman’s reclining head-sculpture titled Big Head Sleeping, spoke about the materiality and shape, asking how a single body part connects to a dominance of a head, but with a cut-out presence. Her sculpture stood as an abject with introspection, critically studying our contemporary culture. 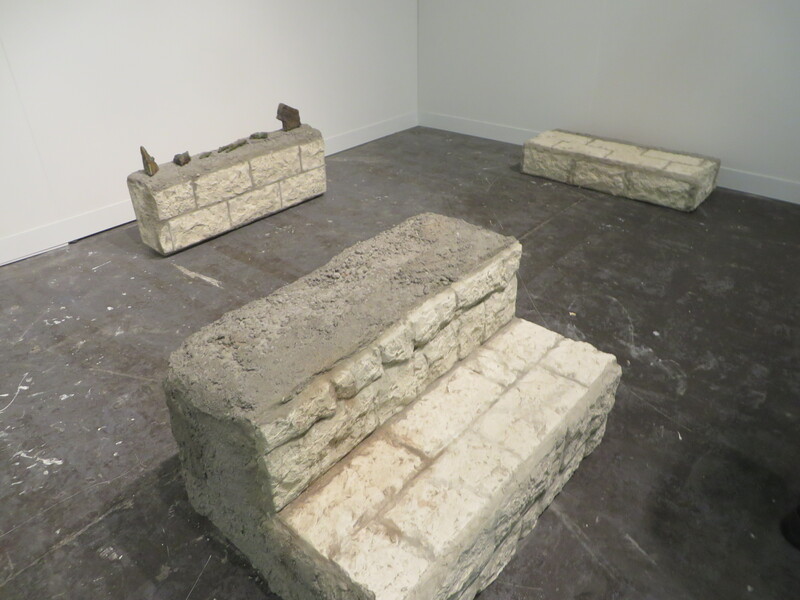 Jumana Manna, ‘Menace of Origins’, 2014, installation view, presented by CRG Gallery. This year, The Armory Show included a curated section highlighting the geographic region of the Middle East, North Africa, and the Mediterranean. Jumana Manna was one of the artists featured in this section, presented by CRG Gallery, New York. Manna’s works stand for ruins, and act out the disappearing landscape of people and their cultural heritage. More general references are to the origins of the culture, since the artifact nature of the ruins is present. Yet, her works narrate of the idea of the home, and perhaps of the lost home. The artist uses film and sculpture to capture history, anthropological sensibility, and truly benefits from the performative ways to present realities of her projects. Another focus artist was Mona Hatoum’s art presented by Alexander and Bonin, New York. Mona Hatoumi’s black circle on the floor, appears as if it is glued to the space, leaving lots of room for interpretation. Overall, the curated section in this year’s art fair comprised of fifteen gallery presentations from across the globe, including non-for-profit institutions. 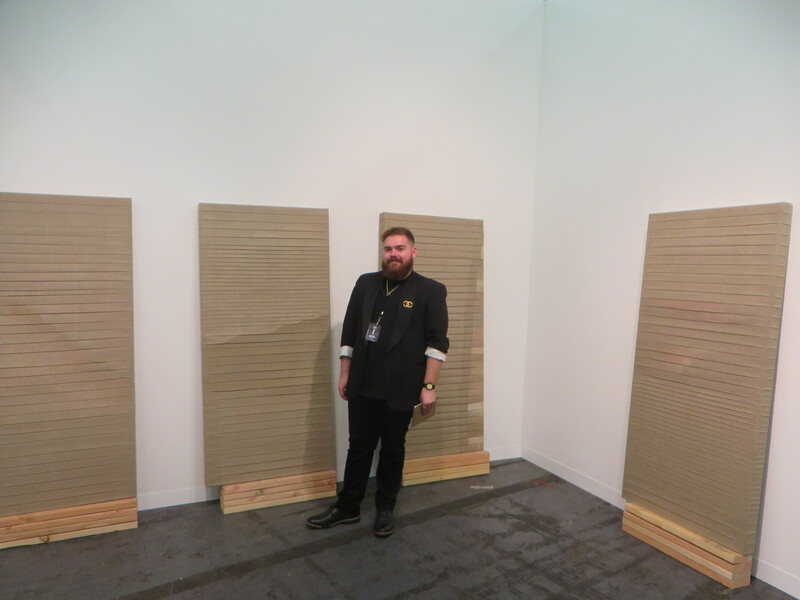 The Armory Focus 2015 was curated by Omar Kholeif, a curator based at the Whitechapel Gallery in London. 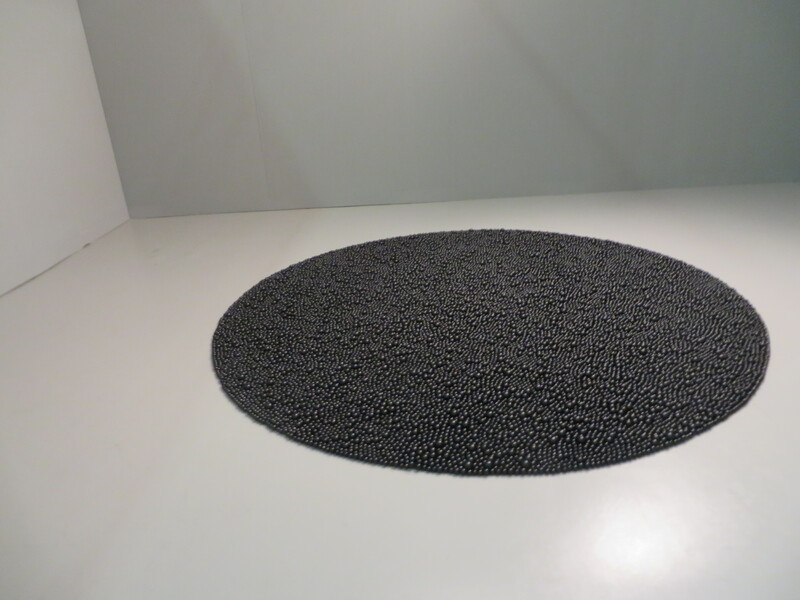 Mona Hatoum, ‘Turbulence (black)’, 2014, glass marbles, 3 x 250 cm diameter. Presented by Alexander and Bonin. What else was capturing the moment factor? The time of the selfies, and an act of self-reflection, when we are looking at ourselves and the others in the mirror, having object-devices as the backdrop of our doings: performing ourselves, and putting ourselves out there in the social media, which in someways acts as today’s mirror. This is a theme that young generation artists will return to with new and different ideas. One is the always relevant question of identity, how we look ourselves in the mirror, and what does the mirror show. This interplay is shown in Alicja Kwade’s mirror-sculpture titled, Figure. It stands on a leg, being humorous, historic, reflecting the person-in-charge, whoever looks into the depths. Alicja Kwade, Figure (2014), presented by Johann König. 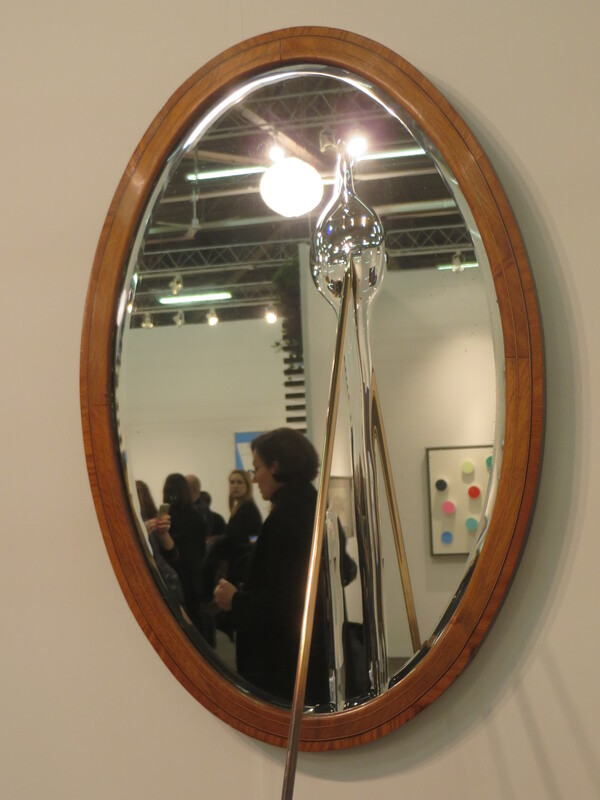 The Armory Show 2015. 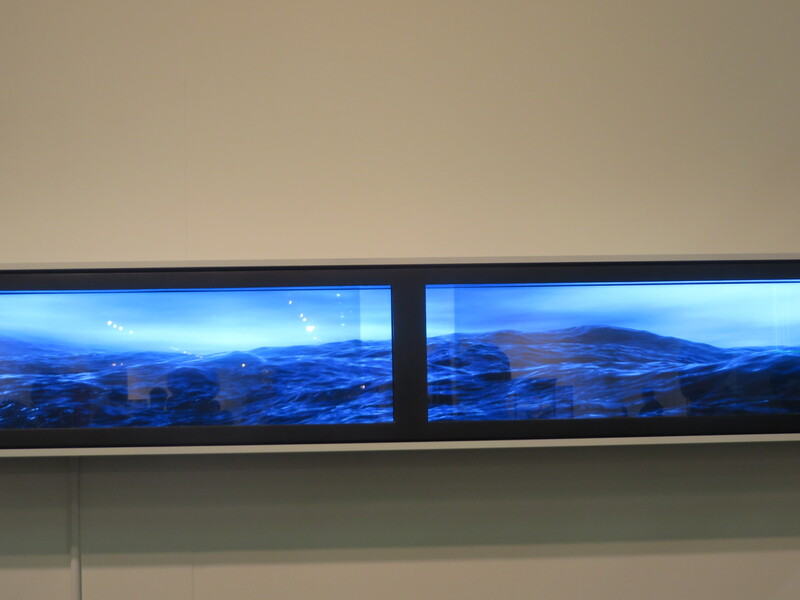 Yargo Alexopoulos, The Long Swell, 2014, digital animation on custom cut LCD display, powder coated aluminum, polished stainless steel, glass, custom electronics, 10 x 31 x 6 inches, edition of 8 + 2 AP, duration: infinite loop, presented by Bryce Wolkowitz. Environment is one topic in the current art world. And it should be. Among the chaos, across the globe, where natural disasters and turmoil take place on a regular basis. Art necessarily reflects this. The references are not too obvious, but you can understand the point through the presentation. Such was the installation by Yargo Alexopoulos, presented by Bryce Wolkowitz from New York. The infinite loop might as well be artificial, but it connects to the ocean, presenting a dynamics of the water surface, as monotonous and as moving with tension. 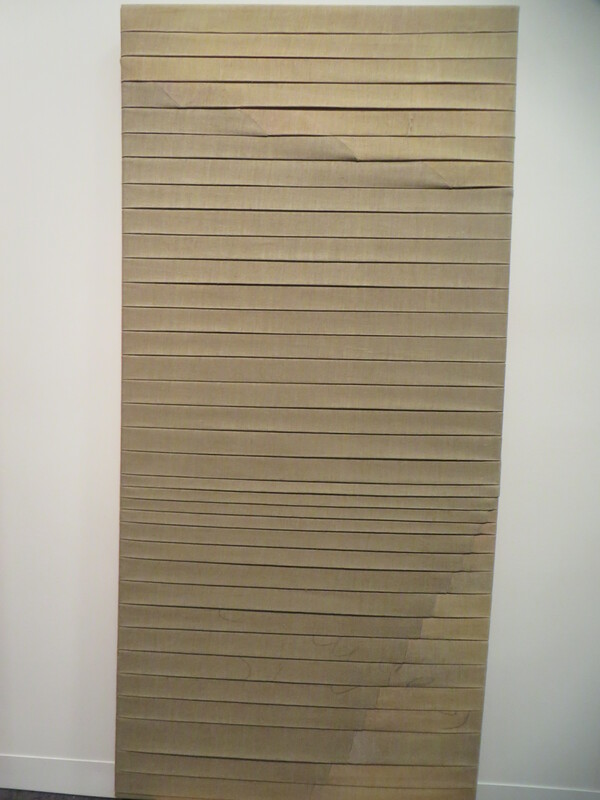 Similar subliminal feel comes out of the visual imagery of Catherine Yass, presented by Galerie Lelong, New York. 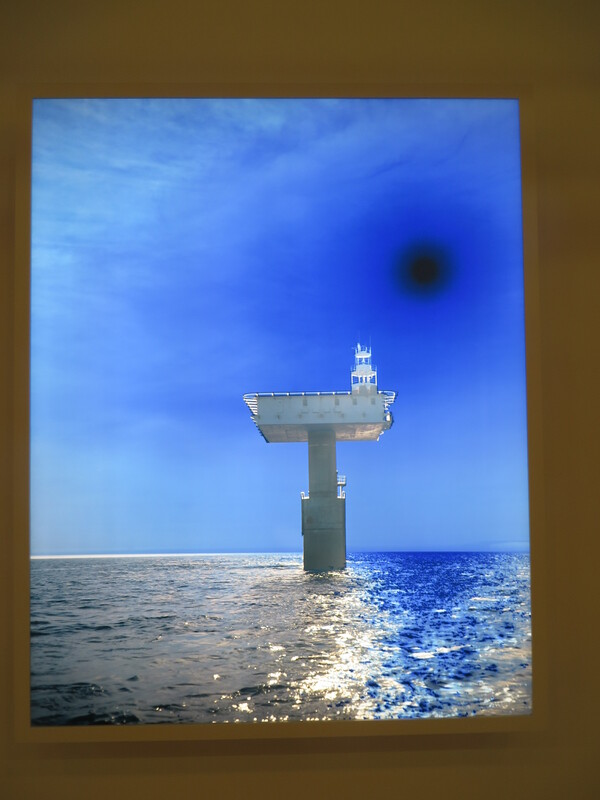 This work was a light-box installation, in which the artist used photographic exposures of the lighthouse and blue-colored filters. The result is eerie, and comes with a message, where the source of light has turned black. Catherine Yass, Lighthouse (East), 2011, presented by Galerie Lelong. One of the personal favorites in this year’s Armory Show was a Los Angeles based gallery which brought along fresh ideas to the East Coast. The meditative palette by artist Luke Diiorio, presented by Anat Ebgi, was unique. The gallery showed his recent work-series titled ttylenol. These linen works praise craft, meditate, and encompass, and have some feel of the work-in-progress. Luke Diiorio’s ttylenol-series, 2015, presented by Anat Ebgi.